I had such a horrible week at work last week that I decided I needed a vacation in order to be able to continue working at that place. So, I announced that I would be taking the next week off. I've just been so exhausted that I've lost my joie de vivre. After work on Friday, Bruce and I threw some clothes in the duffel bags and some food in the cooler and made our escape to the boat. Once aboard, with all of the food stowed, I took a little rest on the port settee and that was it for the night. I remember only moving from there to the v-berth to find my Binky. I slept in my clothes until 5:30 am on Saturday. 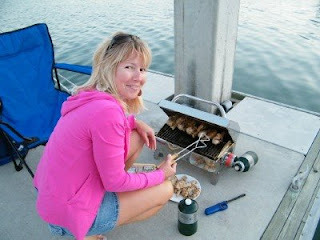 Bruce had gone down the dock to drink beer with Doug and Patty leaving me to sleep. Saturday morning, we had a lazy cup of coffee and contemplated what we might want to do. We took a drive in the Miata with the top down along the island road to the Padre Island Yacht Club where there was a nautical swap meet and book sale. That little car is so much more fun than the motorcycle was. Bruce found some treasures for the boat and a couple of books. We went to a garage sale next where we found a bench for the atrium. The love seat we have had in there has disintegrated. This thing we found is a heavily made futon frame I think, but it's all made from solid boards with rounded edges. We are going to paint it in Miami pastels and maybe find a cushion for it. Let the atrium try to disintegrate this! We took Elan out for a short sail up the Lydia Ann Channel. It was a beautiful sunny day and I got a start on eradicating the pasty whiteness of my flesh. It turned a bit cloudy and cooler so we headed for the dock. 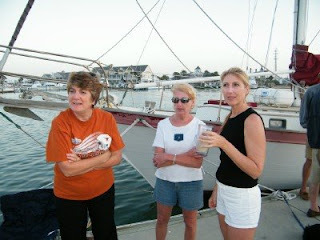 There had been some talk of a dock party and we got back just in time for me to ride to the store with Sharon from Island Time to pick up some stuff to make an hors d'oeuvres tray and some french bread. 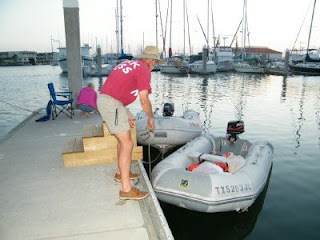 We dinghied over to the other dock at about 6:30 for the festivities. Bruce got to make several trips and ferry others back for things forgotten. He loved it. This is as close to "cruising" as we can get without me quitting my job. We had over 20 people show up for the feast. It's amazing what you can throw together on short notice. 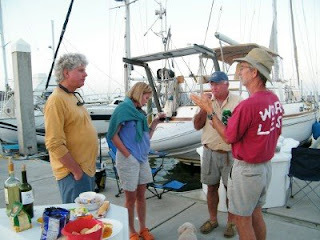 It is always such fun swapping sailing or cruising stories with the other boat people. We ate the snackers and worked on the main course. There was pork loin, chicken and rice, and Bruce's new grill got another workout with the chicken and bratwurst. Sharon did the honors and it was all delicious! We stayed out there talking and laughing until well after dark. 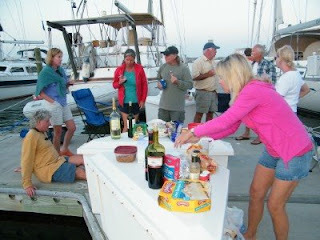 We drank all the alcohol and the party broke up as one by one, we all went back to our boats. We fell into bed thinking it must be after midnight, but when Bruce checked the time, it was just after 10 pm. Oh well, it had been a long full day. Not a bad start for Staycation day #1.